As spring blooms across the state, the historic 1892 Bexar County Courthouse in San Antonio also reveals its former splendor with the ongoing removal of additions that have covered much of the west elevation since the early 1970s, as well as the restoration of the large, double-height courtroom to its glorious 1896 appearance. 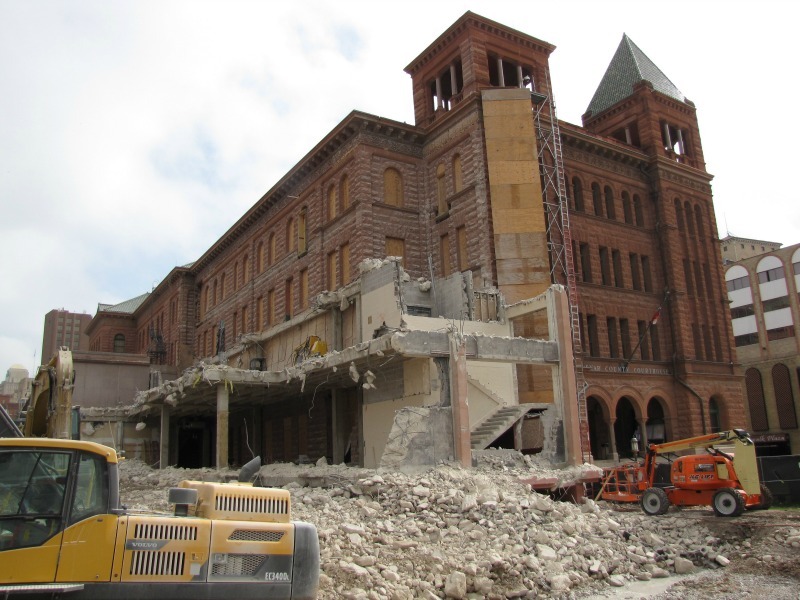 This rebirth, funded in part by a grant through the THC’s Texas Historic Courthouse Preservation Program, has been facilitated by the long-term labors of numerous county officials and staff. Professionals from the Bexar County Facilities and Parks Department take immense personal pride in the job they do overseeing the progress of the construction. The passion they have for “their” courthouse is expressed in many ways, from their day-to-day, hands-on interaction with elected officials, courthouse staff, and architects—as well as the craftsmen and women who are bringing the work to life—all the way to donning a fluffy heart costume and publicly kicking up their heels in front of the courthouse for the cameras in an appeal to “love Texas courthouses.” Bexar County staff has consistently gone to bat for the courthouse that is so dear to them and the community. Now the results of their efforts are beginning to become apparent. 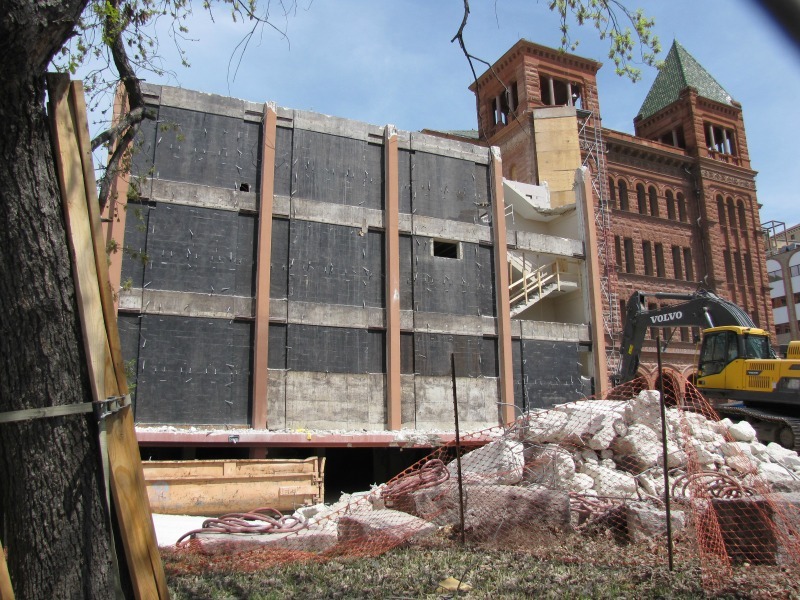 Peeking around the tall construction fences that surround the west side of the courthouse, one can see its historic profile again gracing the Texas sky, without the visually jarring presence of the modern addition that for so many years loomed over the south and west facades. 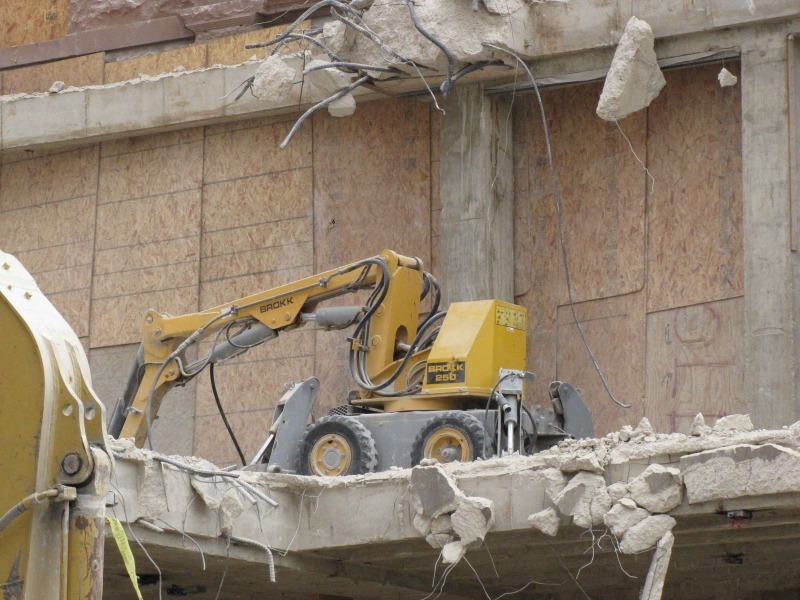 Under the watchful eyes of county facilities staff, this transformation is occurring with great rapidity due in part to the use of Brokk “demolition robots.” In fact, these machines are remotely controlled by human operators from the air-conditioned comfort of a job office, an arrangement that maximizes both safety and the pace of the work. 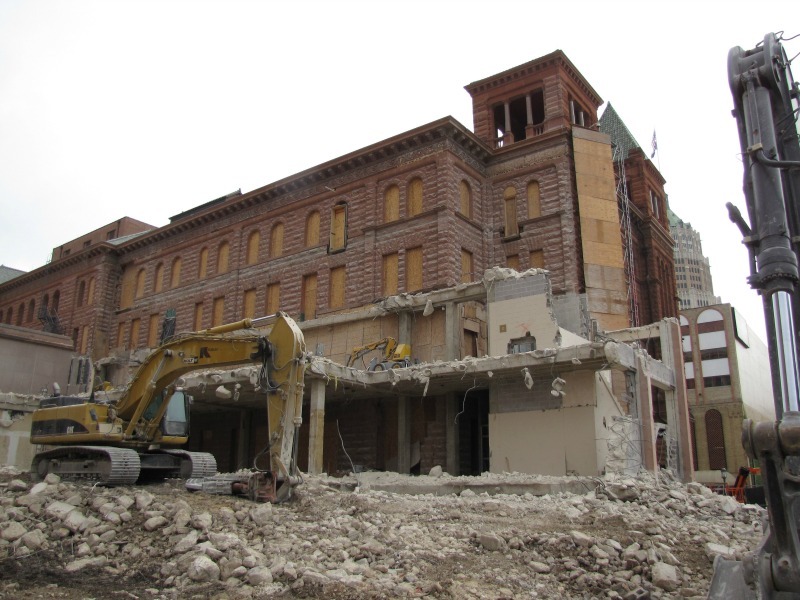 The historic construction of the Bexar County Courthouse in the 1890s was in its day similarly innovative, utilizing electric cranes and steam-driven machinery. 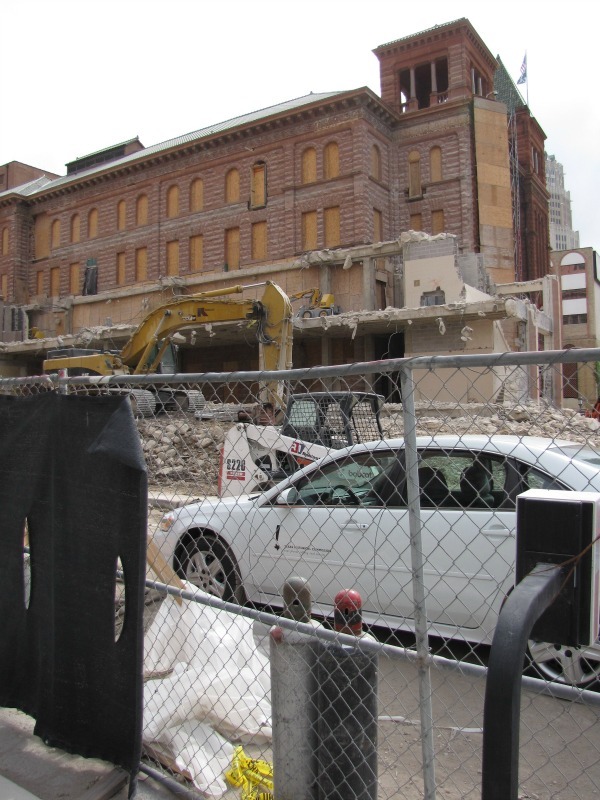 Work on the courthouse continues to push the technological envelope today. Innovation is married with preservation in a process that is, no doubt, a glimpse into the future of construction. 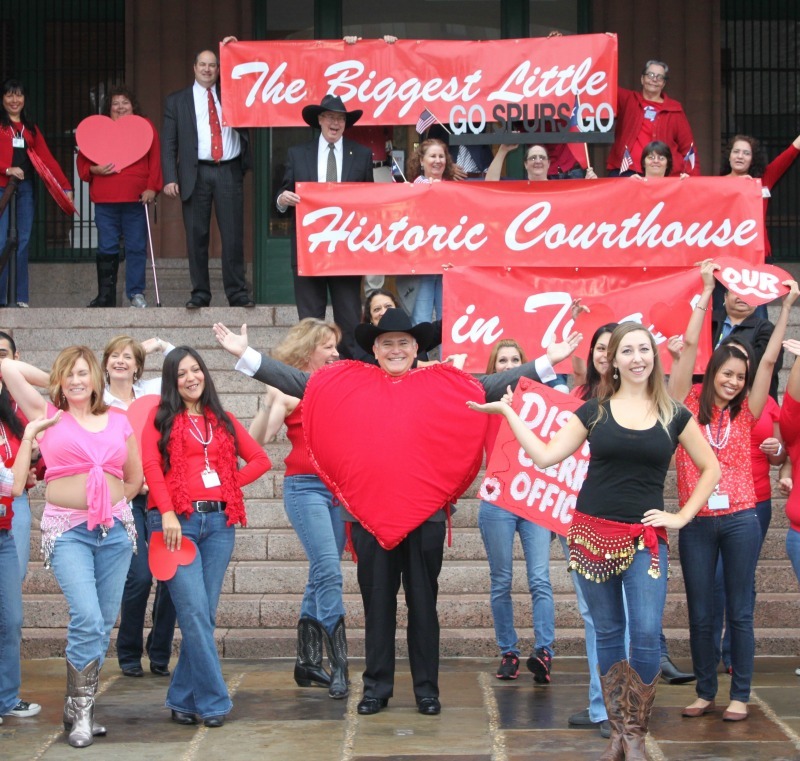 County staff and the public show that the Bexar County Courthouse has a special place in their hearts during our February 2013 “I Love Texas Courthouses” campaign.